General Secretary of Bodu Bala Sena Organization, Ven. 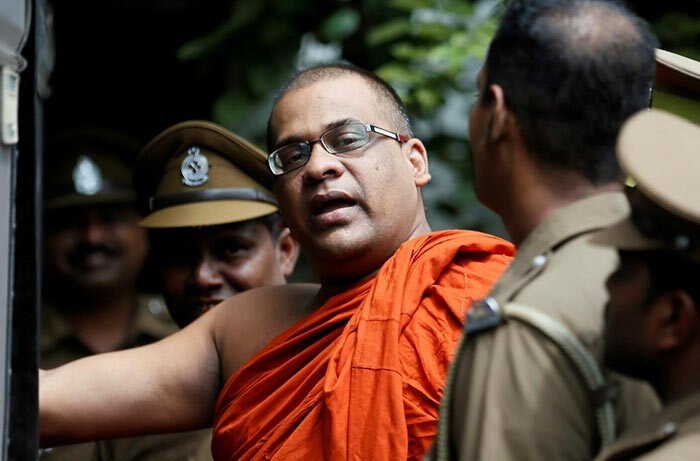 Galagoda Aththe Gnanasara Thera, who is being medically treated in Sri Jayewardenepura Hospital under imprisonment, had been issued a light jumper (Liberty Dress), the Prisons sources said. This dress is said to be given to the prisoners in the hospital. Accordingly, it is said that he is dressed in a white sarong outside Andanakadaya (Under robe). Liberty dress includes a white sarong and a white shirt. A spokesman said that this light dress is issued to the prisoners, who were taken to the hospital and the court but the wearing of the jumper was compulsory when they were imprisoned. It is reported that this liberty dress had been issued under No W17640 to Gnanasara Thera, who is undergoing medical treatment in the paying ward No.5 of the Sri Jayewardenepura Hospital. He is under the protection of a jailer and two guards with weapons. Meanwhile, Prisons Head Quarters said in spite of the fact that he had been sentenced to six years Rigorous Imprisonment; it would be reduced to four years during imprisonment.